Meyer Gradwohl was born in 1828 in Alsace, France. Around 1858, he arrived in San Francisco, California. He and his wife, Frederique, were naturalized as U.S. citizens soon after. 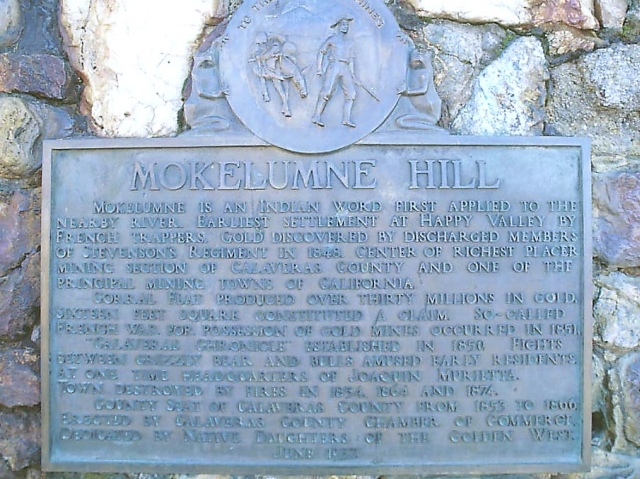 In 1860, Meyer Gradwohl and his family moved to Mokelumne Hill, California, where they lived with his in-laws. In 1861, Gradwohl and his brother-in-law, Isaac Blum, opened a general merchandise store on Main Street. They also filed a mining claim together in 1868. In 1863 and 1865, Meyer Gradwohl filed several mining claims in Calaveras County. In 1874, he bought one of Gustave Danielewicz’s stores in Mokelumne Hill. The store, a former saloon run by Harris Coleman, became a furniture shop, where Gradwohl also sold pianos and watches. That same year, Mokelumne Hill suffered a major fire that destroyed Gradwohl’s original store on Main Street. Since the Danielewicz store was constructed from stone, it survived the fire. In 1876, Meyer Gradwohl entered into a partnership with Charles Jacob (of Bavaria). Theirs was a dry goods and grocery shop. The partnership ended by 1887, and Charles Jacob retained ownership of the store until 1900. Around 1878, Meyer Gradwohl and his family moved to San Francisco. There, he joined Morris Cohen in a butcher shop partnership. They opened a branch of the store in the Bay City Market at 1146 Market Street. Gradwohl was a member of the Mokelumne Masonic Lodge #31 of Calaveras County. He served as treasurer. In 1858, Meyer Gradwohl married Frederique Blum (b. 1830) in San Francisco. They had three children: David (d. 1861), Maurice (b. 1859), and David (b.1862; named for his deceased elder brother). Meyer Gradwohl died in 1900 in San Francisco. Frederique Gradwohl died in 1905. They are both buried in the Hills of Eternity Cemetery in Colma, California. 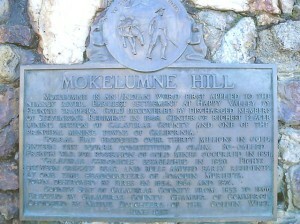 Mokelumne is an Indian word first applied to the nearby river. Earliest settlement at Happy Valley by French trappers. Gold discovered by discharged members of Stevenson’s Regiment in 1848. Center of richest placer mining section of Calaveras County and one of the principal mining towns of California. Corral Flat produced over thirty millions in gold. Sixteen feet square constituted a claim. So-called French War for possession of gold mines occurred in 1851. Calaveras Chronicle established in 1858. Fights between grizzly bears and bulls amused early residents. At one time headquarters of Joaquin Murieta. Town destroyed by fire in 1854, 1864, and 1874. County Seat of Calaveras County from 1853 to 1866. Erected by Calaveras County Chamber of Commerce. Dedicated by Native Daughters of the Golden West, June 1933. Victoia Fisch, “The Danielewicz Store of Mokelumne Hill, California,” Western States Jewish History 44/1. Samantha Silver is curator for this Meyer Gradwohl exhibit.